If you want to take your movies on DVD discs with you on the road, or just want to clean up those physical discs but keep your films and TV shows on your HTPC, or store your DVD in safe from any damage, you'll need to rip the DVD discs on Mac or PC first. Thankfully, there are plenty of great utilities designed to make the process easy and give you files that are playable on any device you choose, whenever you choose to watch them. Here we will introduce the best 2 free DVD Ripper for Mac: Handbrake and MacTheRipper. You may have heard about them before. Now just get the top Mac DVD Ripper freeware and rip the DVD movies to videos with ease! Handbrake is our favorite video encoder for a reason: it's simple, easy to use, easy to install, and offers a wealth of tweaking options to get the best possible file as a result. If you're daunted by them, you don't even have to use them - the app will compensate for you and pick some settings it thinks you'll like based on your destination device. So many of you like Handbrake that many of you use it in conjunction with another app (like VLC, which makes ripping easy) - you'll let another app do the rip and crack the DRM on your discs, and then process the file through Handbrake for encoding. The app is fast, can make the most of multi-core processors to speed up the process, and is completely open source. Best of all, it's completely free. Since Handbrake can only convert DVDs to MP4(M4V) and MKV, if you want to convert DVD to other video formats like FLV, WMV, etc., Handbrake cannot help you do that. You can learn how to use Handbrake for Mac to rip DVD on Mac. MacTheRipper is a free DVD ripper for Mac. With it, you can remove the DVD CSS encryption and rip DVD content. This free Mac DVD ripper is mainly used to convert commercial movies you have purchased for personal use to your hard drive. However, it only rips the DVD menu and all to your computer in VOB formats. If you want to get other video formats like MP4, AVI, FLV, MOV, WMV, etc., you need a third party Mac video converter to convert the ripped VOB files to the video format you want. Please note that any copyright-infringing activity you use to perpetrate with MacTheRipper is illegal and immoral. 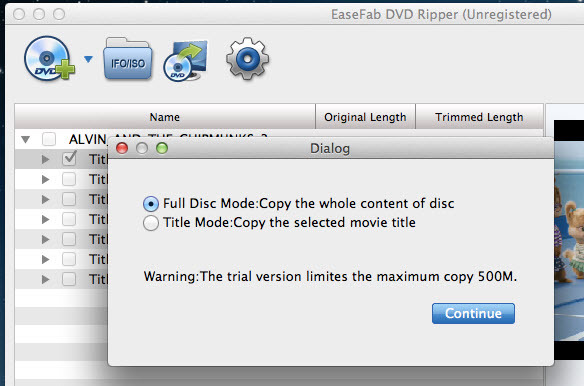 If you want to rip any DVD to any video format you like with fast ripping speed and good video quality, you can turn to EaseFab DVD ripper Mac OS X. With this Mac DVD ripping shareware, you can rip and convert DVD to all video/audio formats for any players and mobile devices easily and seamlessly. You can get the converted files with fast speed and high quality. 1. Rip and convert DVD to virtually any video/audio format lossless. 2. Convert DVD to optimized format for enjoy the videos on mobile devices like iPad (iPad mini), iPhone (iPhone 4S, iPhone 5), Blackberry, Samsung and more. 3. Support editing the video to gain better visual effects.